This is a Spanish novelty because in the Los Amigos Mine Chrysocolla wasn't mentioned before. 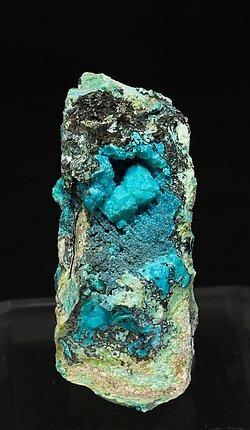 We should also mention that the appearance of this Chrysocolla is very attractive as it isn’t just a crust as usual but it has nice forms covering what seem to be crystals of Quartz and probably Chalcedony. 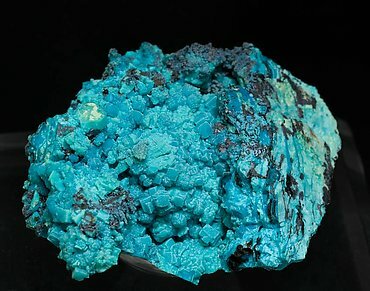 These nice forms together with their great color, generate what is, in our opinion, the best Chrysocolla found in Spain and nearly as fine as the nicer ones from other countries. As usual when we offer unusual things like this, we will send a copy of the analysis to the customer. 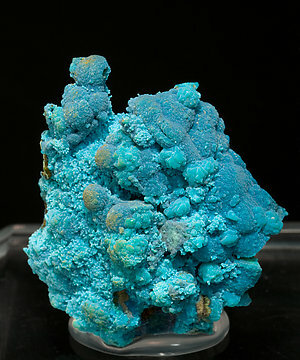 Crust of botryoidal growths, with a great color, that cover a rocky matrix with small Quartz crystals. In our opinion these are the best Chrysocollas ever found in Spain. The sample has been analyzed and we’ll send a copy of the analysis to the buyer. 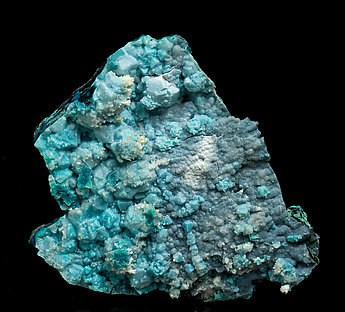 Aggregates on matrix of Chrysocolla pseudomorphous after small cubic crystals of Boleite. This rare pseudomorph was discovered a few years ago, but on paler samples, in an area near Amelia (not in the mine itself), but until the end of 2010 new samples had not been recovered. A novelty at Tucson 2011. Spheroidal aggregates on matrix of Chrysocolla pseudomorphous after cubic crystals of Boleite. This rare pseudomorph was discovered a few years ago, on much paler samples, in an area nearer to the Amelia Mine (not at the mine itself) but until the end of 2010 they have not been able to recover new specimens. 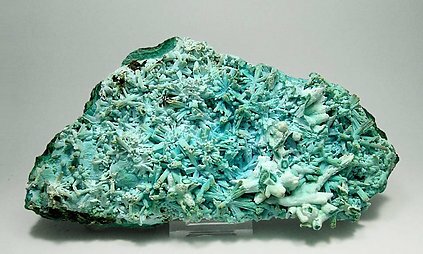 Aggregates on matrix of Chrysocolla pseudomorphous after cubo-octahedral crystals of Boleite. This rare pseudomorph was discovered few years ago, but on paler samples, in an area near Amelia (not in the mine itself), but until the end of 2010 new samples had not been recovered. 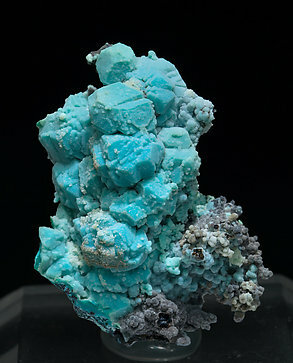 Aggregate on matrix of Chrysocolla pseudomorphs after small crystals of Boleite and also forming concretions and botryoidal growths. This rare pseudomorph was discovered a few years ago in an area near Amelia (not in the mine itself), but until the end of 2010 new samples had not been recovered. 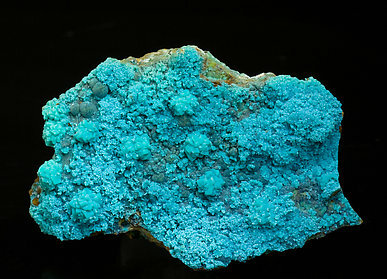 Aggregate on matrix of Chrysocolla pseudomorphs after cubic crystals of Boleite. 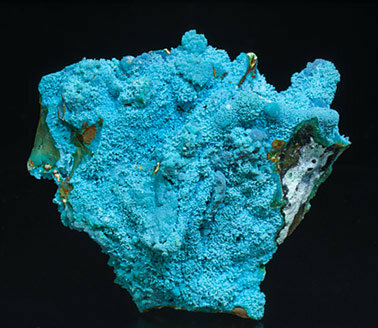 This rare pseudomorph was discovered a few years ago in an area near Amelia (not in the mine itself), but until the end of 2010 new samples had not been recovered. 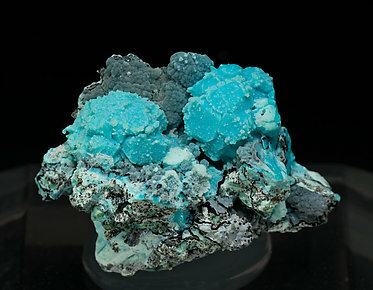 Aggregate, on matrix, of Chrysocolla pseudomorphs after cubo-octahedral Boleite crystals. 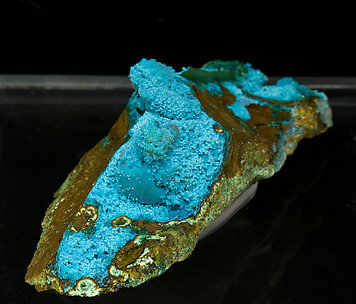 This rare pseudomorph was discovered a few years ago in an area near Amelia (not in the mine itself), but until the end of 2010 new samples had not been recovered. A novelty at Tucson 2011. 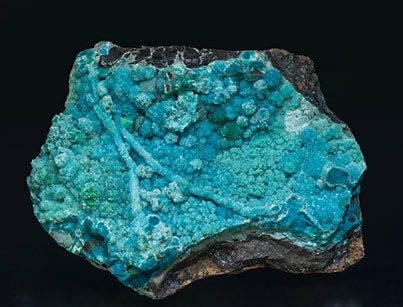 Spheroidal aggregates on matrix of Chrysocolla pseudomorphous after cubo-octahedral crystals of Boleite. This rare pseudomorph was discovered a few years ago, on much paler samples, in an area nearer to the Amelia Mine (not at the mine itself) but until the end of 2010 they have not been able to recover new specimens. 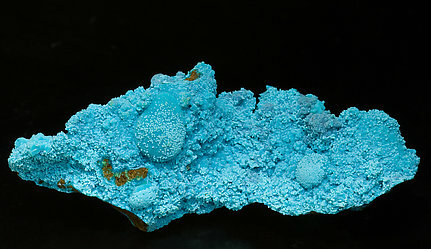 Group of Gypsum crystals comletely replaced by Chrysocolla. 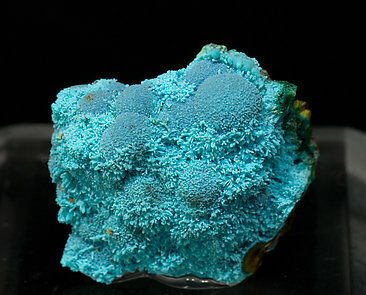 The crystals are on a botryoidal-concentric formation of the same Chrysocolla but the color is more intense. The sample is from the exceptional collection of Dr. Marvin D. Rausch, which label we’ll send to the buyer. 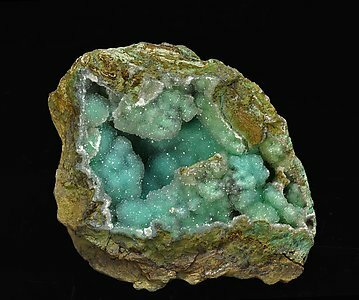 Spheroidal aggregates, very much more isolated than usual for the species, with a very intense greenish-blue color, with small Malachite crystals and on a limonite matrix. A very esthetic miniature. 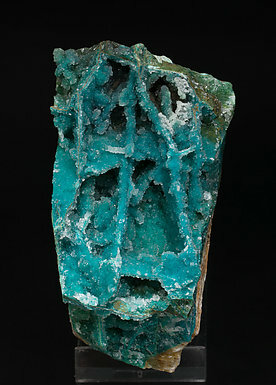 Spheroidal Chrysocolla growths on a rocky matrix. The Crysocolla is partially coated by small Quartz crystals. 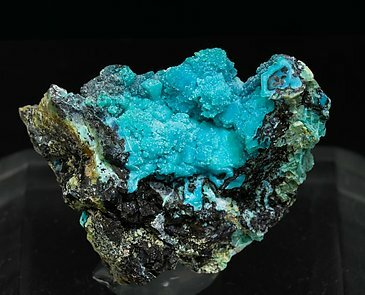 This coating in some areas on the sample is complete and visible due to a more intense luster and a deeper color (turquoise blue) of the Chrysocolla. 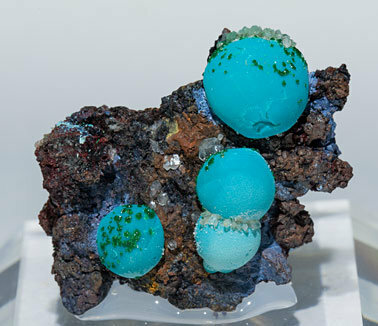 Bluish globular growths of Chrysocolla covered by microcrystalline aggregates of transparent Quartz that fill a cavity in the matrix. It is from a classic North American locality. 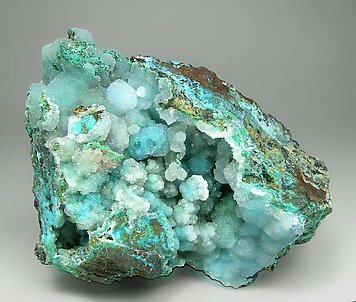 Globular growths on matrix of very clear bluish green tones, almost coated by globular growths of tiny crystals of Quartz. 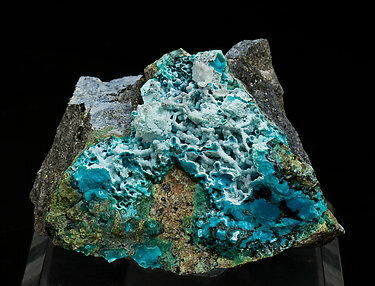 A honeycomb growth, on matrix, of micro-crystals of Quartz completely covered by turquoise blue Chrysocolla, with intense greenish shades.